Ok, it is time for Fiber Enabler Monday, a new timesucking, avoidant, procrastinatory, I don’t want to write my lab report, helpful thing devised by me to enable your fiber addictions. In which mostly I’ll just go on and on and wax rhapsodic about some of my favorite fiber artists and tell you where you can get their stuff. String Theory Fiber Arts is one of those nifty little Etsy shops you may have heard mentioned on Lime and Violet once upon a time (because the ladies, they have impeccable taste, non?). And the woman behind that nifty little Etsy storefront, who also happens to be a friend of mine and a recently published author, makes some good stuff. She also named a colorway after me, and it’s a totally awesome colorway called Rainwood which is, in her own words, “Start with equal parts heart and zen grooviness. Mix with generous helping of goth stompy boots. Swirl together with determination, strength, and hilarity. Serve with a lovely pot of tea (the good stuff, -please-!). Dude, that’s some love right there. And I love her right back. I’m totally trying to get her to start a limited edition batt club because her batts are completely inspired. Her rovings make for fluffy, squooshy, awesome yarns. 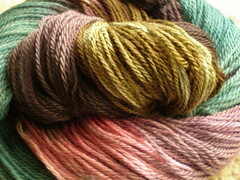 Everyone should have a little String Theory in their stash… check her out! This entry was posted in Strings, Sticks and Wheels. Bookmark the permalink. 3 Responses to Fiber Enabler Monday…. what is your Etsy name so I can give you credit for prosletyzing! !